What can you use an aerated tank, stop nets & specialist electric fishing equipment for? Our Sampling and Collection teams and Fisheries teams are working together to survey the fish in the River Loddon and Blackwater, as part of a national monitoring programme. Dave Hellard an Environmental Monitoring Officer from the Sampling and Collection team explains more. “I’ve been working for the Environment Agency for just over 6 years. Part of my work involves surveying the rivers around Berkshire, Surrey and Hampshire. 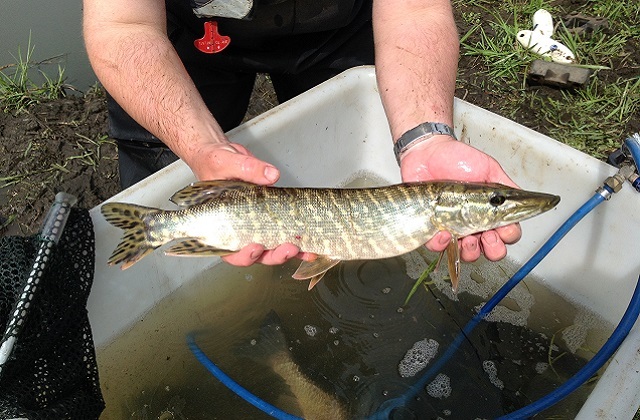 We’ve been using a pulsed DC current (electric fishing) to carry out the surveys. This momentarily stuns the fish and draws them towards the anode, where they are lifted from the water in a net. We then transfer the fish to a highly oxygenated tank of water to recover." Electrofishing is a common method used to sample fish populations and collect valuable data about the health of a river. The process does not harm the fish. “Once they’ve recovered, we then process them. This means taking a few scale samples which we use to age the fish and look at their growth rates. Depending on how many fish we catch; (sometimes dozens sometimes thousands) a typical ‘depletion survey’ will take 5 people approximately 3 hours. Obviously the more fish we catch, the longer it takes. A typical depletion survey consists of 3 to 4 runs (a ‘run’ means electric fishing the stop-netted section of river, starting at the downstream end, working upstream) of 100 metres of river. These surveys are being done as part of the National Monitoring Programme in accordance with our Water Framework Directive sampling programme. The Water Framework Directive is a piece of European Union legislation designed to preserve, restore and improve the water environment. It establishes a framework for managing the water environment in a holistic manner taking into account environmental, social and economic factors.